The Impossible Dream: We all have one! I came across this quote today and have to admit, it’s tempting to take it on face value. As I read it, I can imagine the rush of warmth from the sense of triumph as it pours from my head into the rest of my body! Ah! the satisfaction of achieving something someone has branded, ‘impossible’! Nothing quite like it! The idea that you can’t do something can be a negative thing. What’s the point in trying? No point in reaching for that goal, no point in even taking the steps that might just lead to the foot of the stairs you haven’t the heart to climb. How many dreams have I turned the extinguisher on before they even properly caught..? I daren’t think! On the other hand, being told you CAN’T do something, may strengthen your determination! 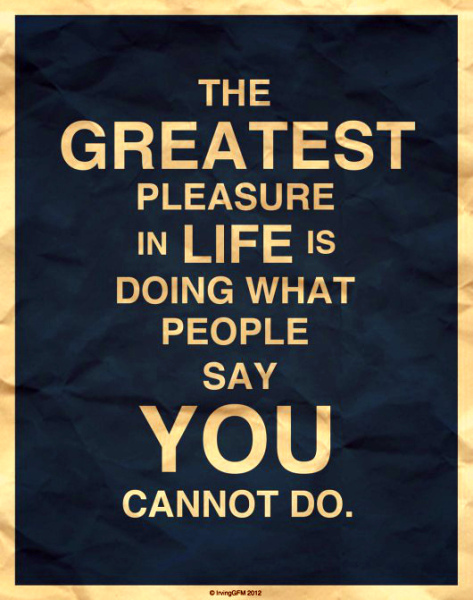 It might make you grit your teeth and set out to prove them all wrong! Achieving the seemingly impossible, can often be the result of sheer grit and perseverance. Today I continue to strive for something that seems impossible. I have been given mixed opinions on how realistic it is. Some have said ‘yes’, some say ‘no’. A lot have said I’d need to settle for less. I hazard a guess that most impossible, implausible and unrealistic achievements have been battles hard fought and won by people who refused to listen to anyone but that inner drive. The hunger inside that won’t be deterred. And when it gets too tiring, they’ve stopped for a rest, but then they’ve got back up and carried on. I want to be one of those who keeps focussed on the end prize and not on the whispers of others’ opinions. I want to be motivated by the impossible, not defeated. Anyone with me? Are you fighting too? If so, it can really help to remember a time where you’ve had that feeling of triumph!